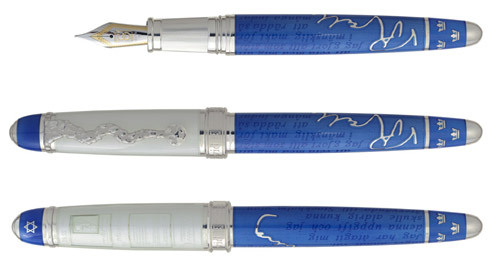 The Magna Carta collection is the twenty-fourth in the David Oscarson� series of Limited Edition Writing Instruments. Produced in three primary color variations, each will be limited to production of 800 pieces (including Fountain Pen and Roller Ball styles) in commemoration of the 800th anniversary of King John�s official sealing of the document June 15th, 1215. The La Sagrada Familia Limited Edition Collection is a tribute to Antoni Gaudi�s contributions to the magnificent Basilica in Barcelona. A tribute to the Rosetta Stone which provided the key needed to unlock the mysteries of ancient Egyptian Hieroglyphic text. A celebration of the American Art Deco movement and 15 years of excellence in design by David Oscarson. The Collection will stand as a lasting tribute to the Prince of Botanists, a national hero in Sweden. The year 2013 is a Black Water Snake year according to the Chinese calendar. the Chinese Dragon is the ultimate symbol for good fortune, power, happiness, immortality, and fertility. Limited to 88 pieces in each of the four finishes. A tribute to the enduring wisdom of the Mayan culture. Each color variation is limited to 88 pieces (including fountain pens and rollerballs). A lasting tribute to the 63 years of Alfred Nobel�s historical life and his enduring influence around the world. Production of translucent hard enamel demands the highest levels of patience, experience and skill. The Harvest Collection continues in the spirit of artistic mastery and the tradition of Old World craftsmanship. Continuing the spirit of artistic mastery and the tradition of Old World craftsmanship by combining the technique of Guilloch� with the art and expertise of Hard Enamel. The Trellis Collection continues in the spirit of artistic mastery and the tradition of Old World craftsmanship by combining the centuries-old technique of Guilloch� with the art and expertise of Hard Enamel. The Collection incorporates three levels of Guilloch� and three colors of translucent and opaque hard enamel. A marriage of skill and creativity is achieved by combining the centuries-old technique of guilloche with the art and expertise of hard enamel.